The human genome project has provided detailed knowledge of the human DNA sequence and revealed its complexity. Genes and gene-related sequences (pro-motors, introns, etc.) account for about 25% of the 3300 Mb of DNA and only about 3% of the genome represents coding sequence. Repetitive sequences form a large part of our genome and are the basis of the polymorphisms detected at the molecular level and of the heteromorphisms observed at the chromosomal level. Repetitive DNA sequences are found either as individual repeat units interspersed throughout the genome, or as tandemly repeated units or motifs in various chromosomal locations. Three main types of tandemly repeated DNA sequences, classified by the length of the individual repeated motif and by the total size of the repeated units, are satellite,minisatellite and microsatellite. 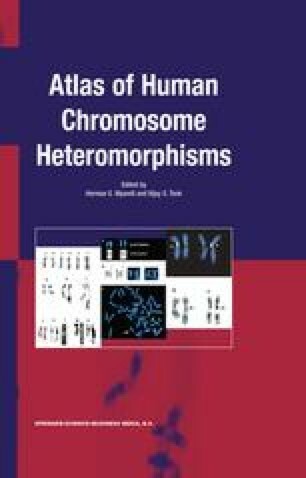 This chapter describes only tandemly repeated sequences, as these play a more significant role in chromosomal heteromorphisms.